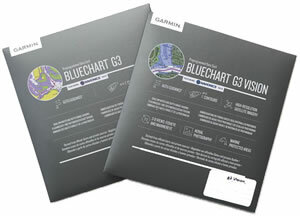 Garmin BlueChart g3 Vision Europe charts are available in three sizes; Small, Regular and Large (the larger the chart, the more coast/water/sea is included in the coverage). Scroll down this webpage to view all 'Small' Europe Garmin g3 Vision BlueCharts. Garmin BlueChart g3 Vision Small charts are perfect for adding extremely rich marine cartography charts to compatible Garmin marine chartplotter. Read more about Garmin BlueCharts g3 Vision (Small, Europe). Small charts available to buy include Thames Estuary, English Channel Central East, Blackpool to Cardiff, Barcelona to Valencia, Golfe Du Lion to San Remo and Portugal. All of the Garmin BlueChart g3 Vision small maps available from ActiveGPS are genuine Garmin marine charts and are preloaded on microSD/SD card. These SD cards then plug-and-play in compatible Garmin marine devices. The Garmin g3 Vision BlueCharts that we sell will operate on a Garmin chartplotter with an SD/microSD card slot (older devices with DataCards are no longer supported) but will not work when used with a Garmin handheld device. For full compatibility please see an indivdual BlueChart page e.g. Garmin BlueChart g3 Vision Barcelona and Valencia.